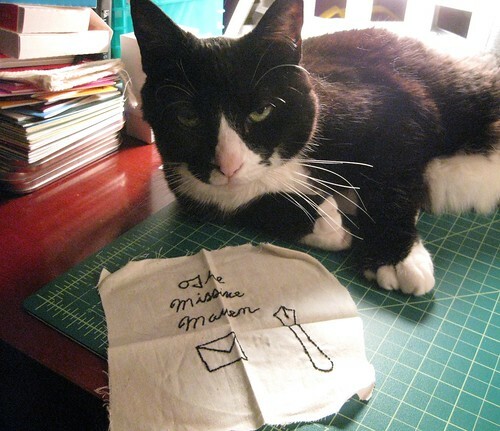 My crafty and creative pen pal, Carla (of the Tiny Angry Crafter blog) is pretty darn handy with a needle and thread. Along with a recent letter, she included this fantastic embroidered gift, sewing a cute fountain pen and envelope icon, too. Soda and I both love it! I'm just making happy noises right now, no biggie. I'm really glad you like it, and I'm glad I won Soda's approval! Aww that's a lovely touch. Soda is so dang cute. That's some nice needle work. Very, very nice. I think this picture would make a great postcard! 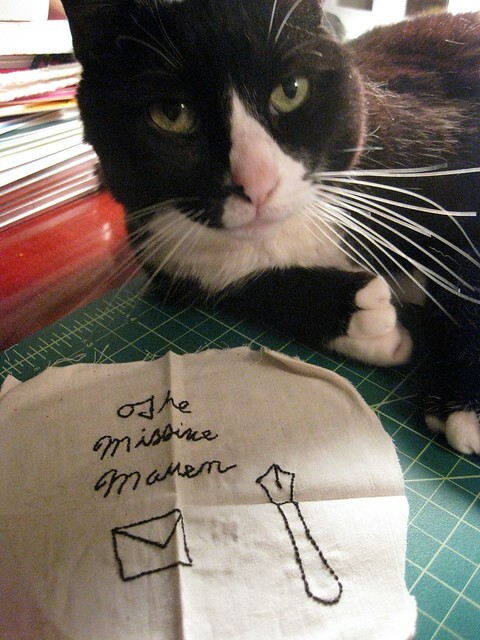 Soda is ever so photogenic and the embroidered piece is a handcrafted logo. StoneZebra- what a wonderful idea! :-) Soda is sitting next to me and purring as I type this, and she appreciates that you think she's photogenic.